Last night as we were putting the boys to bed, Adam was being extra cuddly because he had hurt himself at the playground that evening. I was hugging him, and his arms were wrapped tightly around my neck (while Daddy was changing his diaper....:P). Matthew, being jealous, started hugging my back (I love it when they do this.. seriously sweet). Then a little Matthew face squeezed underneath my arm, "Yo!" he said. This is how he says hello. I wanted to melt from all the cuteness. (My love language is physical touch and quality time, so I especially love family cuddles). 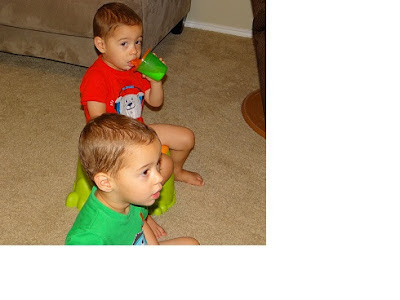 Recently though, the boys have been reporting their dirty diapers to me, and have been excited to sit on the potty (usually with no result, because they would ask after they had already gone). The last few days I have started putting them on the potty routinely at the same times each day. I have tried this off and on before, but with no success. Monday they had lots of successful potty times, but still way too many trips to dump out the contents, so I switched them to the big potty. (Which almost swallowed them up :P) This morning we made a special trip to Target to buy a potty seat for the big potty. We have been using that all day using stickers as rewards. They have pooped or peed every time I put them on. Then they stick their own sticker on the paper I have taped to the lid of the toilet. I am surprised they actually wait their turn. They still aren't dry in between potty trips, but I feel like there is no turning back on this path! Wish us luck! Lots of trips to the potty today!